Funny and then touching. I hope Martha gets to read this. Thanks, Dena, I think she will read it. And I AM coming to Ireland!!! 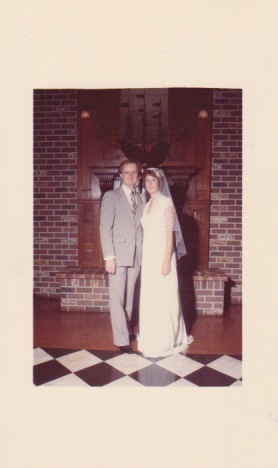 Congradulations on your 35th wedding anniversary. You were married one year before us. Great advise you gave your daughter. Ann could you please tell me the name of your book so I can read it. I have found one book written by a Ann Coleman unsure if its your book. Sadly, I doubt that you will be able to find a copy. It’s called “Getting Rid of Harold,” and it was published by an educational publisher as part of a series to be used for high school readers who were reading about the sixth grade reading level. I don’t think it’s in print anymore, and it was never in bookstores, just in their publishing catalog. (Simon and Schuster Educational Group.) Publishing it wasn’t such a big deal, although I was thrilled at the time! But thank you for trying to find it….that was very nice of you! Thanks, George! And you are so right, what you don’t say can be very, very helpful at times. I’m still planning on the trip, too! Well said! Congratulations and wishing you many more happy years. Thank you Jodi! And I hope you do get to have a great vacation in Europe! Thank you Pat! I’m sure you and Larry know exactly what I mean! Thanks! As a general rule, the longer I wait to speak in any given situation, the better off I am! Thank you! With luck, years from now, I’ll be writing a post about our 50th anniversary! Personally, I think you should be able to count up the years you have been married, even if it’s not to the same person. I have a good friend who married her third husband (she was his second wife) and they celebrated their 30th anniversary simply by doing the math of how long each of them and been married, even though it was not to each other. And they are very happy together! As for whether my daughter will pay the slightest attention to my advice, only time will tell….. Thanks for your comment! Happy anniversary, Ann! What a wonderful milestone. Happy Anniversary, Ann! 35 years is a wonderful marriage milestone. I hope you get to take that trip next year, and in the meantime, pass along that marriage advice. It’s true. Thanks, Dana! I’m really hoping I go on the trip, too!